Need to bike around in cold weather to get to places? Winterize your bike by adding plastic zip ties around your tires to add more traction when you are biking through ice and snow. Avoid the dreaded scenario of having to defrost a frozen lock by using hand sanitizer, muscle heat rub, or in the case of car door locks, placing a magnetic strip over the opening where you insert the key. For indoor winter hacks, use bubble wrap as insulation for drafty windows and use aluminum foil on the back of heater vents to reflect heat back into your living space. 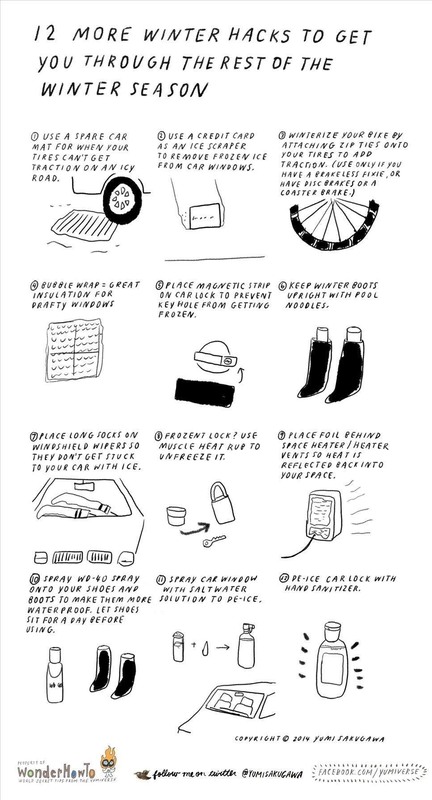 Make sure to check out my original guide for 12 other winter hacks.